To embed a news feed to your website you need to build an RSS link and then embed it onto your website using the RSS widget. Before you can embed a news or event feed to your website, you'll need to first build an RSS feed. 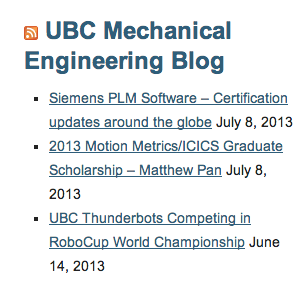 If you are using UBC Events you can build the RSS feed using the Feed Generator, just make sure you select the Calendar Generator to get the RSS feed link. Once you have created an RSS feed, you can follow the steps below to embed the RSS feed to your website. You can embed a news feed from RSS using the RSS widget. 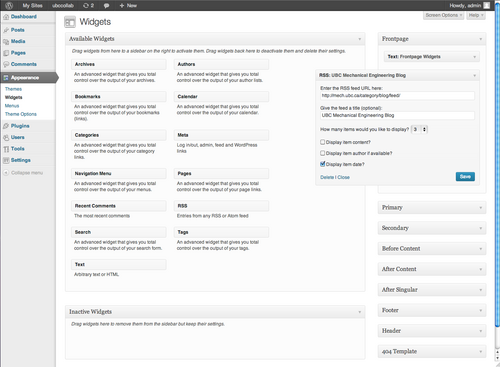 To find the RSS widget, go to the WordPress Dashboard, click on Appearance > Widgets, and look for the RSS widget under Available Widgets. You can drag and drop the RSS widget into the specific section of the site (sections are found on the left hand side) where you would like the news feed to appear. 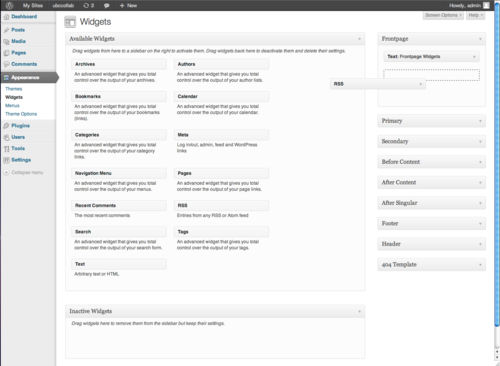 Once the RSS widget is in place, you'll need to configure it. Click on the down pointing arrow of the RSS widget to open it. Lastly, type in the URL of the news feed, give the feed a title (optional), specify the number of items from the feed you would like to display, choose if you wish to display the item content, author, and/or date and click on the "Save" button. You are done! The feed on your website should look similar to the image below.